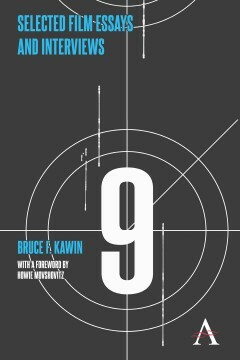 A collection of Bruce F. Kawin’s most engaging and important essays on film, accompanied by his interviews with Lillian Gish and Howard Hawks. This engaging collection of Bruce F. Kawin’s most important film essays (1977–2011) is accompanied by his interviews with Lillian Gish (1978) and Howard Hawks (1976). The Hawks interview is particularly concerned with his work with William Faulkner and their friendship. The Gish interview emphasizes her role as a producer in the 1920s. The essays take up such topics as violence and sexual politics in film, the relations between horror and science fiction, the growth of video and digital cinema and their effects on both film and film scholarship, the politics of film theory, narration in film, and the relations between film and literature. The essays take up some of the most interesting aspects of film, from the effect of film violence on viewers to the changes brought by digital cinema, while remaining readable and free of jargon. As critic Howie Movshovitz says in the Foreword, “his writing is utterly, utterly clear.” Original and independent, the book is free of attachment to any school of criticism or theory, and is dedicated to the fresh and open-minded appreciation of movies. Howie Movshovitz teaches film at the College of Arts and Media at the University of Colorado at Denver. He has been a film critic on Colorado Public Radio since 1976 and has reported on film subjects for National Public Radio since 1987.